In 2005 on the Reykjavik Jazz Festival there was a last minute cancellation. Andres Thor was asked to put together a group to fill the slot. That was the first performance by ASA Trio, although the name would come later. During that concert one of the tunes Andres called was Thelonious Monk's Bemsha Swing and it turned out to be the highlight of the show. Afterward it seemed obvious to all three that they should play again, and the first thing on their minds was playing more music by Monk. And so they set about learning more compositions by the pianist, realizing as they went that the traditional instrumentation of guitar, Hammond organ and drums sounded quite unusual playing Monk's music. After several performances exclusively of his music, curiousity lead them to try music by other unlikely composers like Wayne Shorter, Tony Williams, Fiona Apple, Jimi Hendrix, Bud Powell, Red Hot Chili Peppers, and Ray Charles. The possibilties seemed endless, and everything they played seemed imbued with originality. As they continued to experiment with the music of various composers as well as their own original music, their performances became grab-bag variety shows where one never knew what to expect. Andres had the idea to take on John Coltrane's epic masterpiece A Love Supreme and surprise the audience with it as the entire 2nd set at Cafe Cultura one night in October 2009. Although it was a huge risk, it went amazingly well. They were invited to perform on the 2010 Reykjavik Blues Festival where they played a program of Jimi Hendrix tunes. Having released two live "download-only" recordings. 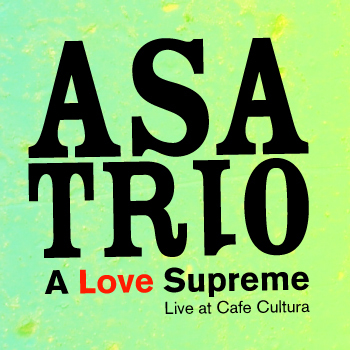 It seemed obvious that ASA Trio needed to record in a studio and release a physical CD. The only question was what music to record? Lana Kolbrún, the jazz dj at Iceland's public radio, had attended several ASA Trio concerts and was insistant that they record the music of Thelonious Monk. Eventually she gave up waiting for it to happen and arranged to have the trio record at the radio. She featured the results in a two part show on the project. In February 2011 ASA Trio released the recording simply titled Plays the Music of Thelonious Monk. Since then the trio continued to perform in Iceland and was invited to Norway to perform on the SildaJazz Festival. Gradually the musicians began to bring in their own compositions to rehearsals until it became clear that the emphasis was shifting in the direction of original music. This culminated in the recording of "Craning" which will be released on October 22nd, 2014 at Harpa in Reykjavik, where they kick off their first European tour which will take them to Norway, Germany, Luxembourg, Holland and France. Andres Thor was born December 27th, 1974 in Reykjavik, Iceland and began studying guitar at the age of 12. After Gratuating from FÍH music school in Reykjavik he went abroad to study in 2000 at the Koninklijk Conservatorium (The Royal Conservatory) in The Hague, Holland. Andres finished his BM in spring 2004 and his Masters degree in the spring of 2006. In Holland Andres studied under the guidance of Wim Bronnenberg, Peter Nieuwerf, Eef Albers, John Ruocco and Hein v/d Geyn as main teachers but also attended workshops and masterclasses lead by musicians such as Michael Brecker, Kurt Rosenwinkel, John Abercrombie and Avishai Cohen. Living and studying in the Netherlands lead to the first CD featuring Andres as a co-leader; “It was a very good year” (WW&T 2004) by the organ trio Wijnen, Winter & Thor. Since then Andres has worked extensively in Iceland and has released two Cd’s under his own name; New Day (Dimma 2006), a quartet outing featuring original compositions by Andres. Blik (Dimma 2009), a trio recording featuring fresh arrangements of standards and two originals. In addition to ASA Trio, Andres has worked in collective projects and as a sideman with bands such as Thin Jim, The Viking Giant Show, BonSom and Andreas Dreier quartet. As well as perfoming regularly throughout Iceland, Andres has performed in the Netherlands, Belgium, Norway, Germany, Luxemburg and Spain. Andres teaches guitar at the FÍH music school and is busy as a session musician in studios, concerts and in theater productions. 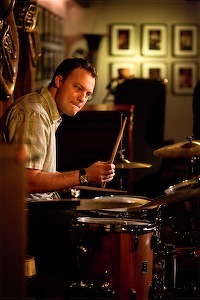 Scott McLemore (b. Feb. 1, 1973 Norfolk, VA, USA) is a drummer based in Reykjavik, Iceland. He began playing music professionally at age 16 with a rock band in high school and joined the rock/funk band Ant Man Bee in 1990 with which he recorded an album and toured the east coast playing the college circuit. Scott attended Old Dominion University 1992-93 where he studied with pianist John Toomey. He also studied drums privately with Howard Curtis and started subbing for Curtis with Toomey and bassist Jimmy Masters. In 1993 Scott transfered to William Paterson College in New Jersey where he studied drums with John Riley, composition with Vic Juris and had various ensembles lead by Rufus Reid et al. He also started playing jazz gigs in nearby New York City. In 1997 he graduated with a B.M. in Jazz Studies. While attending WPC, Scott also toured the US with guitarist Tim Reynolds and John Hebert. The same year he married pianist Sunna Gunnlaugs (after a tour of Iceland with her trio) and the couple moved to Brooklyn, New York. While living in New York Scott played with such talented musicians as: Ben Monder, Michael Kanan, Tony Malaby, Angelica Sanchez, David Berkman, Bill McHenry, Chris Cheek, George Colligan, Kerry Politzer, Alexis Cuadrado, Steve Cardenas, Mark Helias, and Tim Berne. In 2005 he moved to Iceland with Gunnlaugs where he became part of the active jazz scene and has been involved in numerous projects and recordings. His work as a leader has resulted in a recording with Tony Malaby, Ben Monder and Ben Street called Found Music from 2006 on Fresh Sound New Talent Records and in 2012 he released Remote Location on Sunny Sky Records. Agnar Már Magnússon began musical studies at a young age. After graduating from the FÍH school of music in Reykjavík and Conservatorium van Amsterdam in the Netherlands, he studied with Larry Goldings and other private instructors in New York. There, he also was introduced to many known jazz musicians and that led to the recording of his first CD titled 01 with drummer Bill Stewart and bassist Ben Street . 01 was released and distributed around the world by the Spanish record company Fresh Sound-New Talent. Since then, Agnar has released many CDs, most of which have been nominated for the Icelandic Music Awards. These include Tónn í tómið, a live recording of a piano duet with Ástvaldur Traustason, and two CDs with the B3 trio, Fals and Kör, where Agnar plays a Hammond organ. Agnar also released original music to the play Nítjánhundruð, which was staged in the Icelandic National Theatre in 2005, Me for You with singer Kristjana Stefánsdóttir and Atlantshaf with a quartet featuring an all Icelandic lineup. In 2007 Agnar made his second solo album Láð where he creates new music based on old Icelandic themes. Láð has received critical acclaim and an award at the Icelandic music awards. Agnar has now released his third trio record, Kvika featuring Bill Stewart and Ben Street. Agnar has received the Outstanding Musicianship Award from the Berklee College of Music in Boston, and made it to the semi-finals in the Martial Solal international jazz pianist competition in Paris 2002. He has arranged music for CDs and musicals, worked with and written for The Reykjavik Big Band, played in concerts in Iceland and abroad and been musical director in theatre. Agnar has worked with among others: Ingrid Jensen , Seamus Blake, Chris Cheek , Ben Street, Bill Stewart, Drew Gress and John Hollenbeck.